An artist’s interpretation of ancient North American fauna. 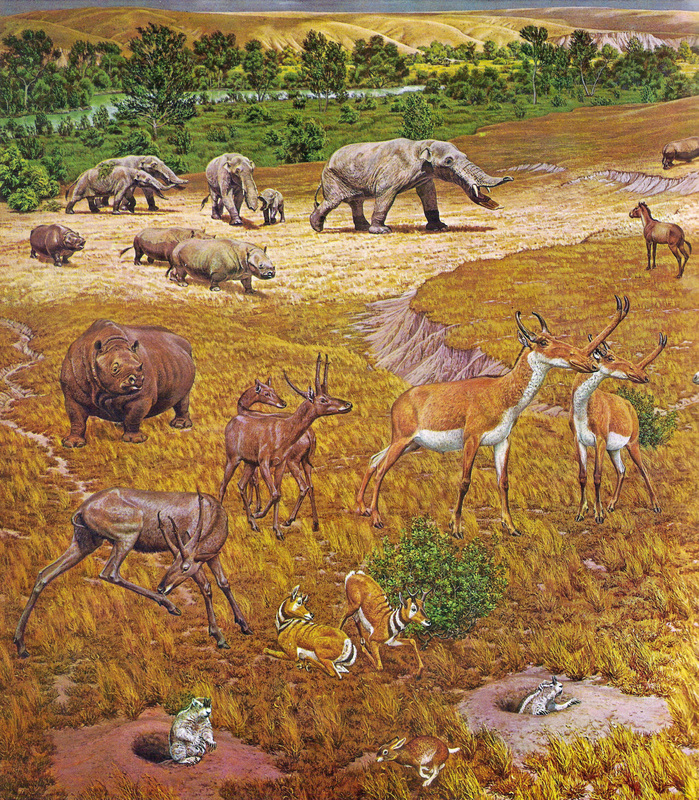 The new study led by The University of Texas at Austin Jackson School of Geosciences revealed that elephant-like gomphotheres, rhinos, horses and antelopes with slingshot-shaped horns were among the species recovered near Beeville, Texas, by Great Depression-era fossil hunters. 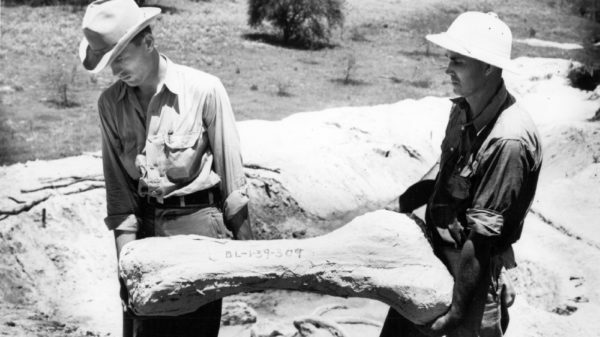 A new study of fossils dug up in Texas during the Great Depression offers the best look yet of an ancient environment. This extensive collection of fossils is helping to fill in gaps about the state’s ancient environment, said Matthew Brown, the director of the museum’s vertebrate paleontology collections. Fossilized skull parts from ancient elephant relatives in the collections of the Jackson School Museum of Earth History. 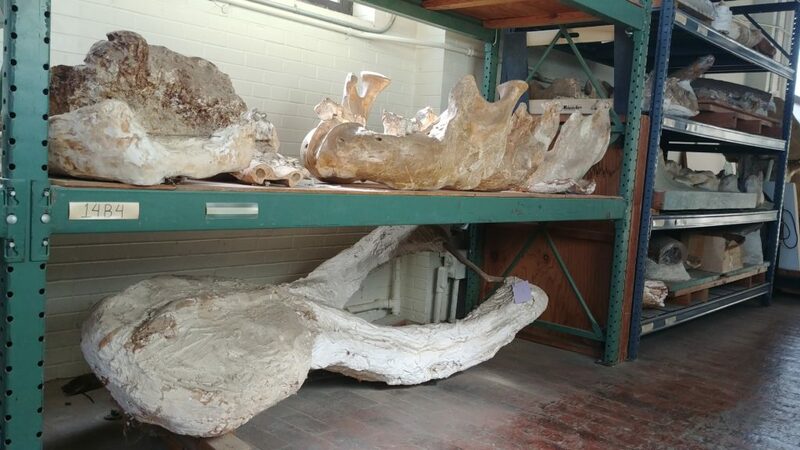 The skull of a shovel-jawed gomphothere (pictured on bottom) collected by Great Depression-era fossil hunters is still wrapped in its field jacket. “They collected the big, obvious stuff,” May said. 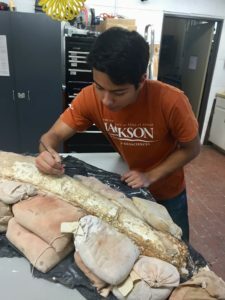 “But that doesn’t fully represent the incredible diversity of the Miocene environment along the Texas Coastal Plain.”University of Texas at Austin student David Ledesma preparing a fossilized gomphothere tusk. He earned his undergraduate degree at the Jackson School of Geosciences and is a current graduate student in the College of Natural Sciences. Credit: The University of Texas at Austin Jackson School of Geosciences.